When I was a little girl, everything I knew about love came from the sappy romance novels that I found hidden in the back of my mother’s bedroom closet. I would steal them and take them out to the woods behind our home and sit and read for hours. It was a steady stream of hot, hard-bodied men, and beautiful, independent women coming together in a fiery, passionate love affair that taught me what love was supposed to be. I carried that belief into young adulthood and was disappointed when no one, man or woman, could live up to the magical fairytale that I was expecting. I met my wife in 2006, and that first year was as amazingly awesome as anything I’d ever read or dreamed about. I was madly in love, and all my dreams were finally coming true. There were roses and chocolates and long nights of good wine and sharing our plans for the future. After that first blissful year, reality came knocking and life intruded, popping that pretty pink bubble that I had built up around us. We were still madly in love but no longer just showing our good sides. You know what I mean, right? When you start farting in front of each other, things get real, really fast. We started having to work on the relationship, work on ourselves, and generally work on making it work. The rose-colored glasses that we were wearing got torn off and replaced by a healthy dose of truth. I made the unhappy discovery that those damn romance novels had lied! But as we continued to press onward I found out that what was beautifully magical was the way in which we helped each other become the best we could be. In all actuality, real love is patient and enduring. It is not the fire of first days, but it is that of a steady, committed, quiet passion that holds us up when the world around us gets messy and complicated. And those, my Dirty friend, were mind blowing concepts! I learned that in order to find true love, you have to love and cherish yourself more than any other. 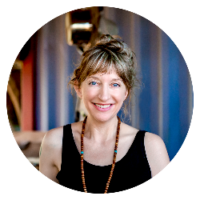 I found out that I needed to treasure, develop, and kindle a passionate love affair with myself. I decided that I needed to be my OWN valentine! It sounds counter-intuitive, right? You would think that you should love someone so completely that you would put their needs and wants before your own. But, that’s not how it works! In fact, the more you put the other person first, the more you neglect yourself. This is true in all relationships – family and friends. Over the last decade I have discovered that the more I focus on loving myself and taking care of myself, the better my relationships have become. When I’m happy, peaceful, confident, and in love with myself then all of those wonderful things come ricocheting right back to me. For me, loving myself includes taking the time to batch the CFDG Plant Fueled Meal Plans every week with a regularity that continues to astonish those around me. 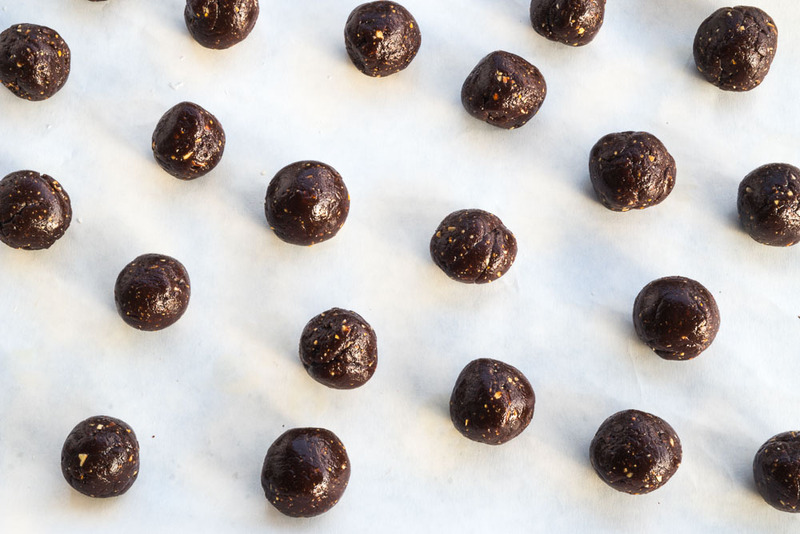 How do you make yourself batch every weekend? The simple truth is that it’s the best way I know to love, nurture, cherish, and nourish myself from the inside out. It’s the easiest thing I can do to bring joy to my heart and peace to my soul. I have learned to tend to my spirit through taking care of my body. It’s that simple. Getting into my kitchen and taking beautiful whole ingredients and magically turning them into the most indescribable dishes has, beyond a doubt, been one of the best decisions I’ve ever made to show myself love. It takes work. Just like the best relationships take effort and time to be happy and fulfilling. Loving yourself requires the work of committed effort on your part to find that sweet spot of true self love. I encourage you to stop and take stock of your life and your relationships. How can you organize and prioritize your life in order to put yourself first? Simply put, I want to challenge you to fall in love with yourself! Take the time to shop for gorgeous plump fruits and stunningly colored veggies. Take the time to find beautifully aromatic spices and fresh fragrant herbs. Take the time to gather multiple types of seeds and nuts while enjoying the various bounty of available whole grains and beans. Take the time to lovingly prepare all of these gifts from the earth to nourish your spirit, support your health, and love your body. We all have the time to love and to love well. And, it can begin with the simple act of batching a week’s worth of delicious plant food to have in your fridge. This will foster healthy choices all week long and those healthy choices will spill over into other areas of your life. As my wife and I approach our 13th anniversary, I’m happy to say that I’ve learned more about real love than any old romance novel could have taught me. I’ve learned that true love means having the security of another person who will always show up for you, no matter what. It means emptying the dishwasher, doing a load of laundry, holding hands when you’re scared or anxious, and being driven to the doctor when you’re too sick to drive yourself. It means shared laughter, big hugs, and stolen kisses. It means getting up with a sick fur baby so the other one can sleep. It means the occasional cup of hot coffee brought to you in bed. It means scrimping and saving towards common goals. It means digging deep and staying put when the going gets tough. True love means being so in love with yourself, and rocking life at your best, so that you are easily able to be everything your partner, friends, and family need and more. Are you ready to love up on yourself? Talk to us in the comments below and tell us about it! 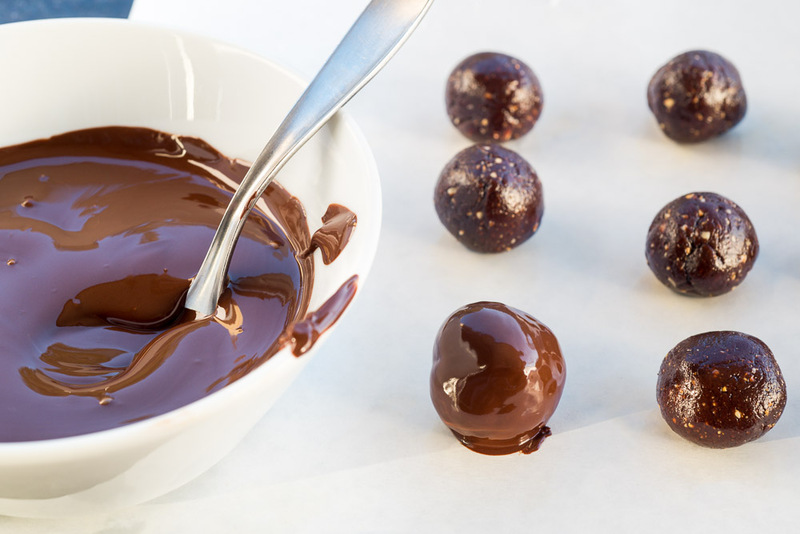 Make 18 - 20 truffles, Note: There are two decorative options for the truffles at the bottom of this recipe. First, let's toast the almonds. Heat a small skillet over medium heat for 2 minutes. 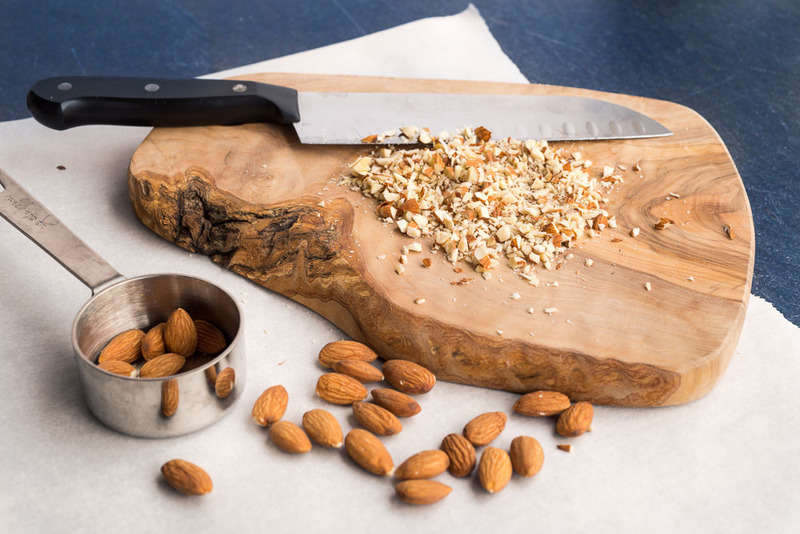 Add the chopped almonds and cook, stirring occasionally, for about 5 minutes or until they are lightly browned. Transfer to a bowl to cool and set aside for now. 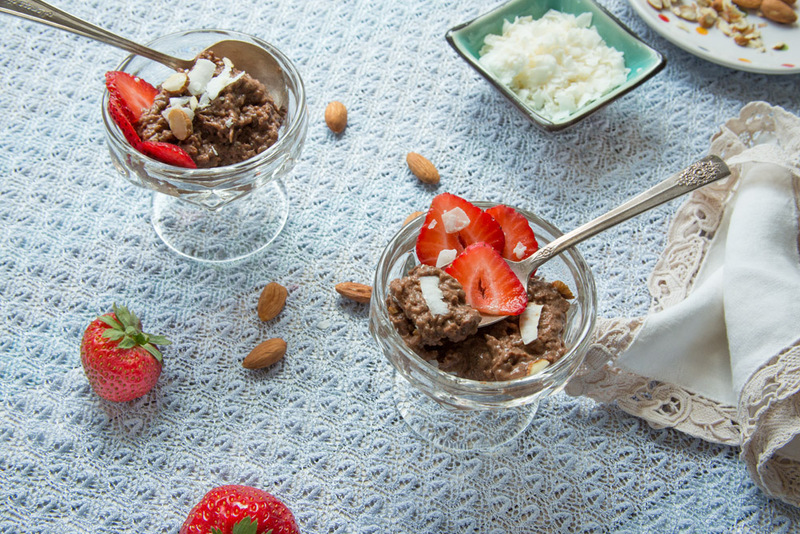 Place the coconut in your food processor and process until you have tiny flakes, a little bigger than sesame seeds. 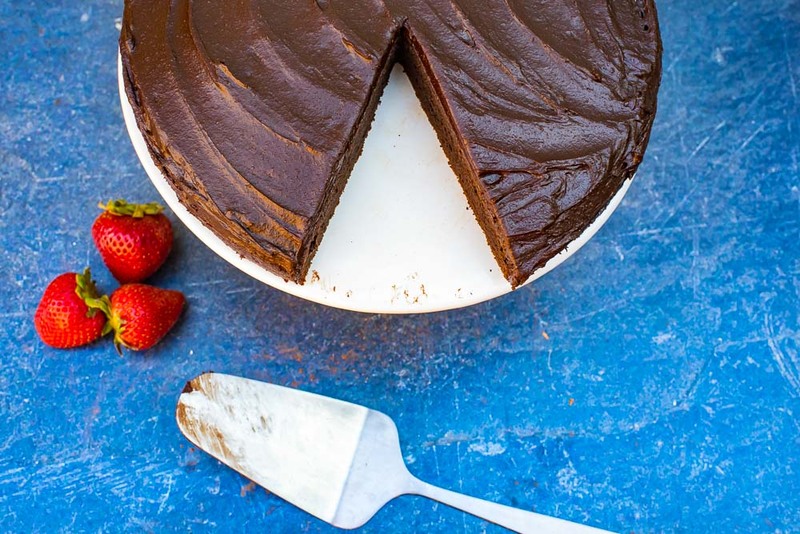 (Don't over process or you'll end up with coconut flour!) Transfer to a small bowl and set aside for now. Place the dates (unsoaked) in the food processor. Pulse until they are chopped into tiny pieces and are starting to become a paste. If it clumps up in a ball while processing, remove the lid and break it up and then continue pulsing. 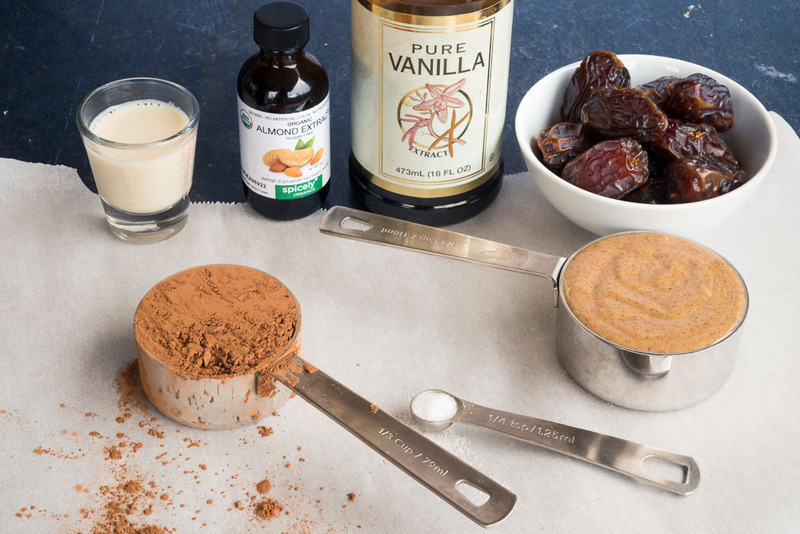 To the food processor, add the cocoa powder, almond butter, non-dairy milk, almond extract, vanilla and salt. Process until completely smooth, stopping to scrape down the sides or break up a big blob if needed. 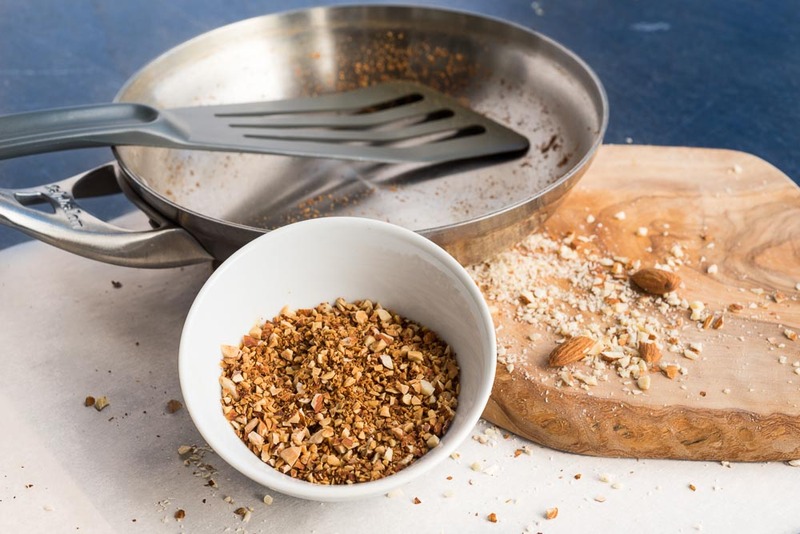 When it's smooth, add the toasted almonds that you set aside earlier and pulse a few times to incorporate them into the mixture. 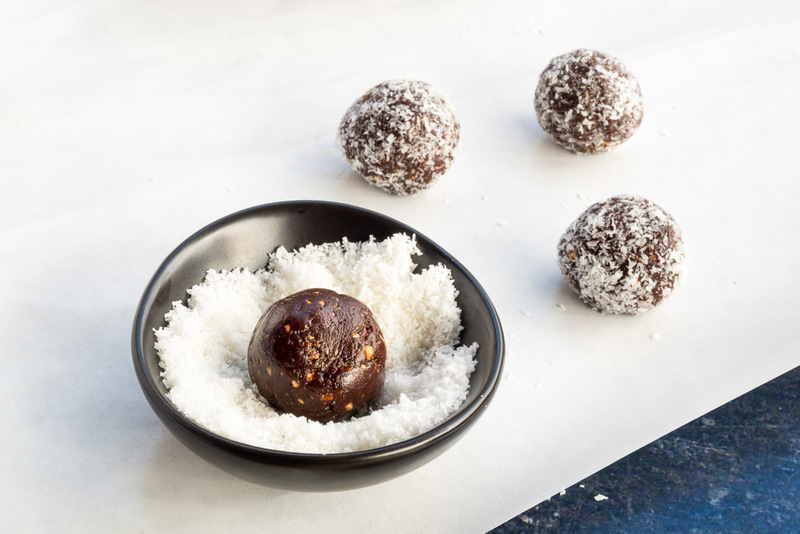 Use your hands to form a 1" ball of the mixture (about 3/4 oz / 20 g) then roll it in the coconut bits you set aside earlier, pressing the coconut into the outside of the ball and forming a nicely-rounded ball. 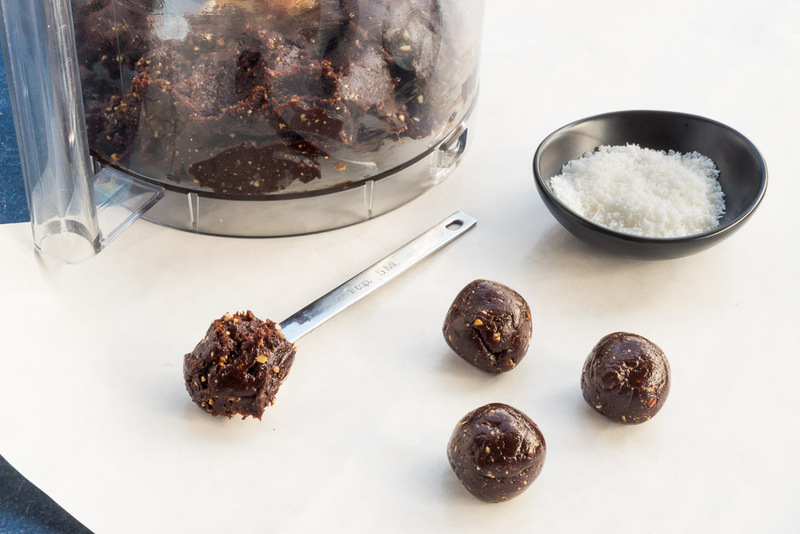 Place it in your storage container and continue this process until all of the truffle mixture is gone. Cover the container and store in the refrigerator. 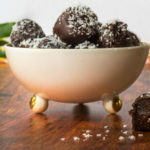 If you're in the mood to fancy these up a little more, form the balls as directed above, but do not coat them in coconut. 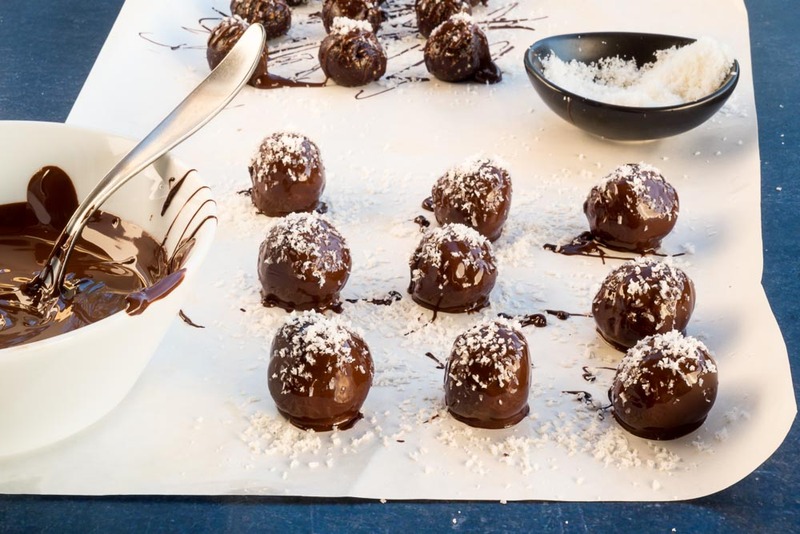 Once you have formed a ball from the truffle mixture, place it on a piece of waxed paper. Continue forming all the mixture into balls and placing them on the waxed paper, about 2 inches apart. 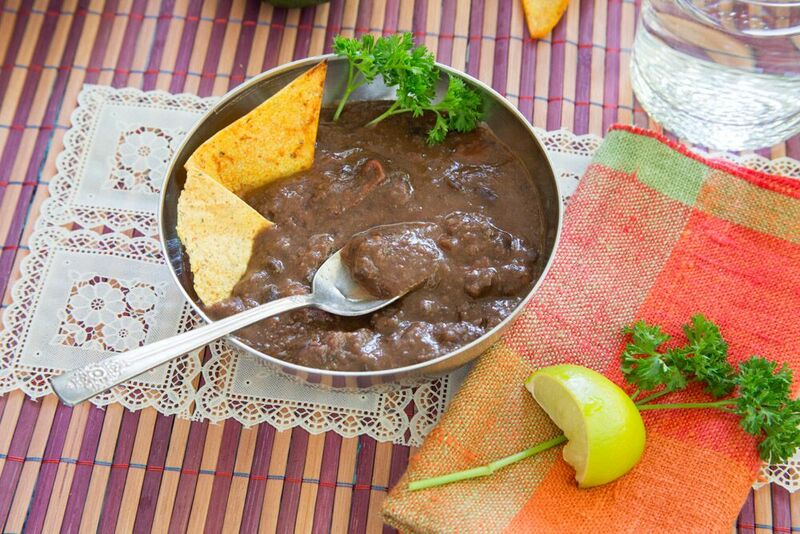 Melt 1/2 cup of dark chocolate (70 g) in a small non-plastic bowl. 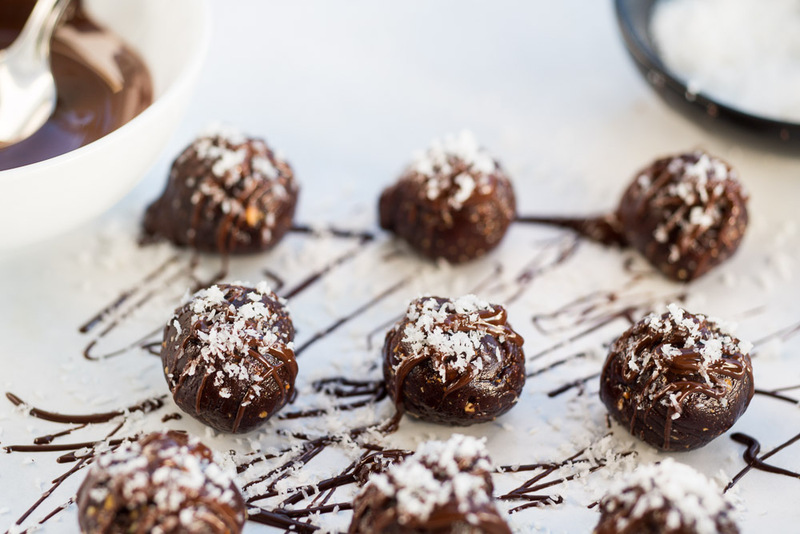 Use a small spoon to drizzle the top of each ball with melted dark chocolate and sprinkle with the coconut bits so they stick to the chocolate. 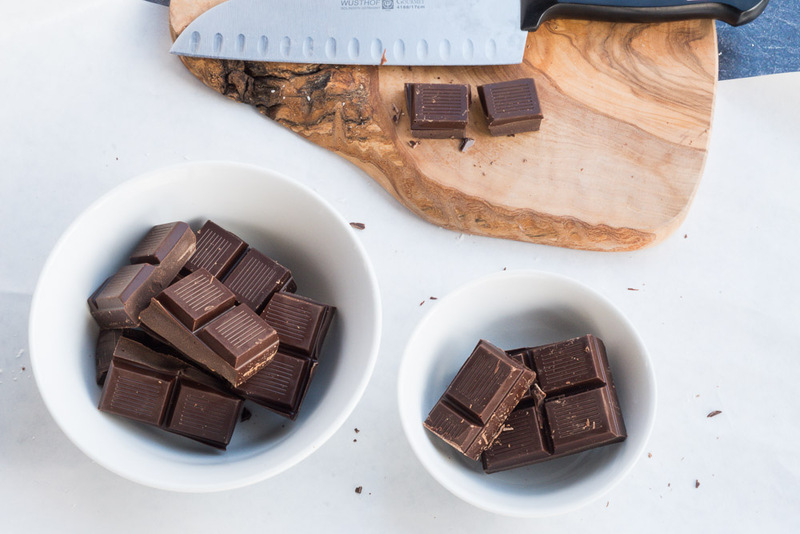 Allow to sit on a table or countertop until the dark chocolate is hard again (a few hours), then transfer to your storage container. 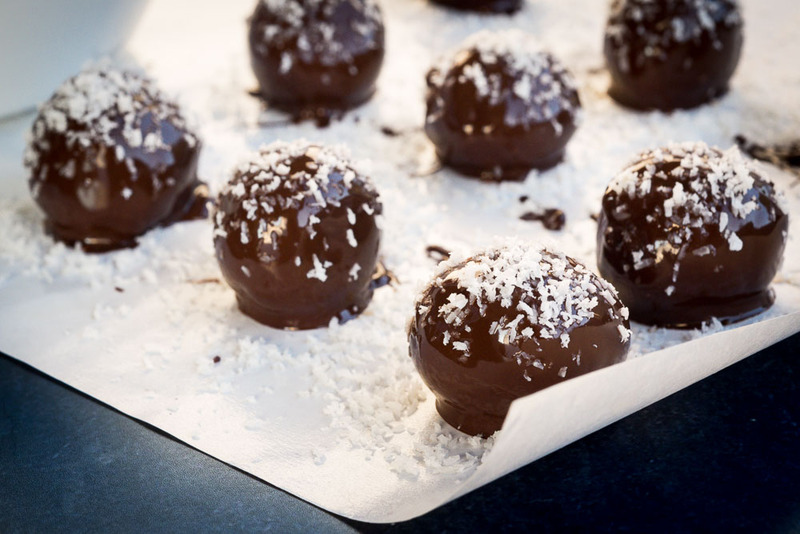 If you want to seriously take these over the top, form the balls as directed above, but do not coat them in coconut. 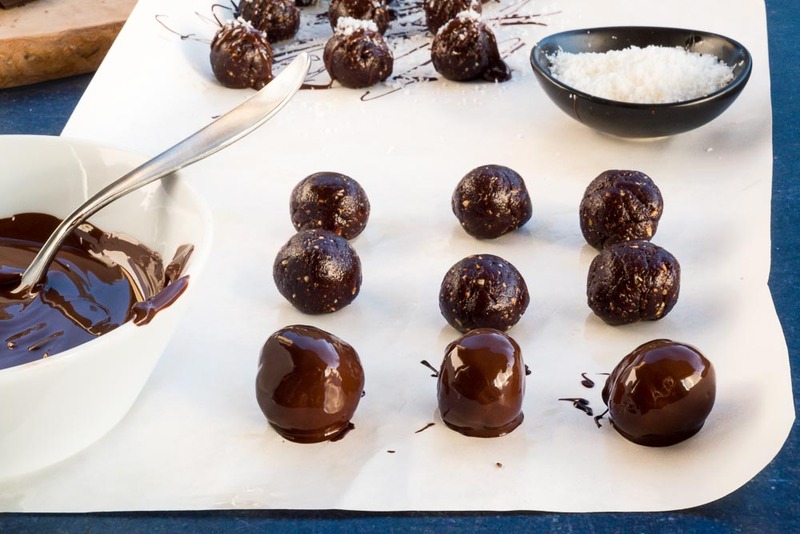 Once you have formed a ball from the truffle mixture, place it on a piece of waxed paper. Continue forming all the mixture into balls and placing them on the waxed paper. 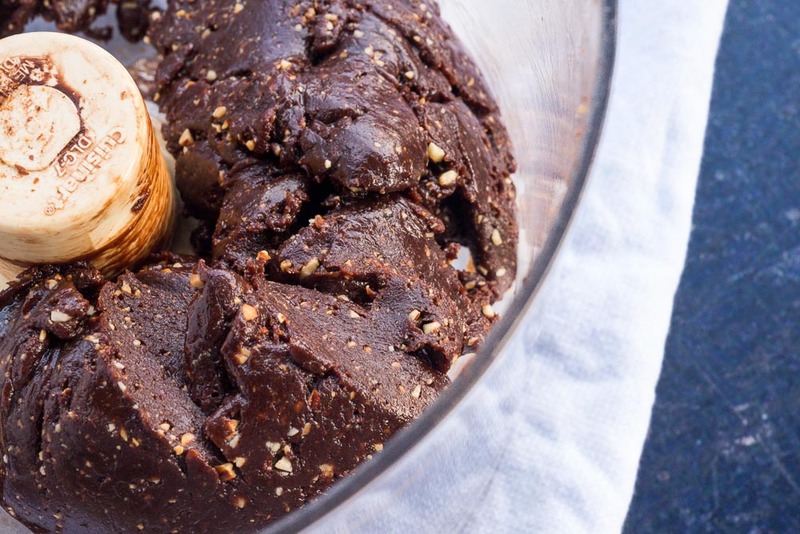 Melt 1 1/2 cups of dark chocolate (210 g) in a non-plastic bowl. 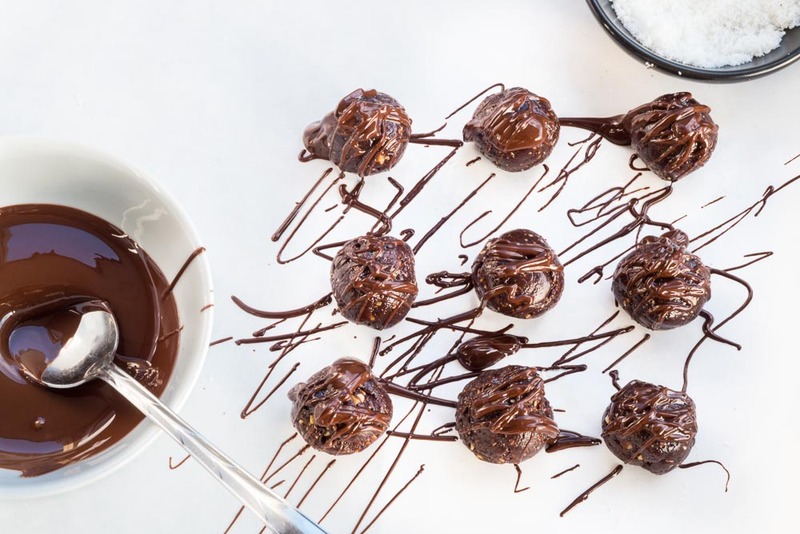 Place a formed truffle into the melted dark chocolate and use a spoon to gently roll it around until it's completely coated. 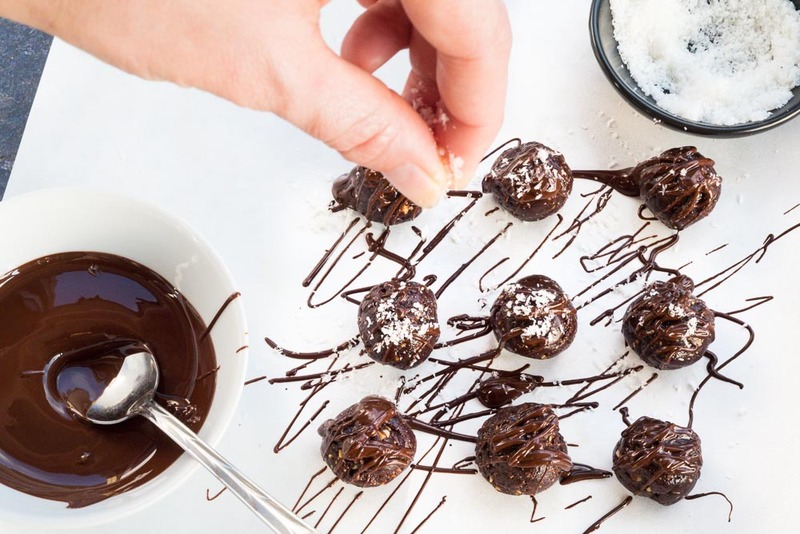 Slide a fork under the truffle and carefully lift it out of the chocolate, allowing the excess to drip off. 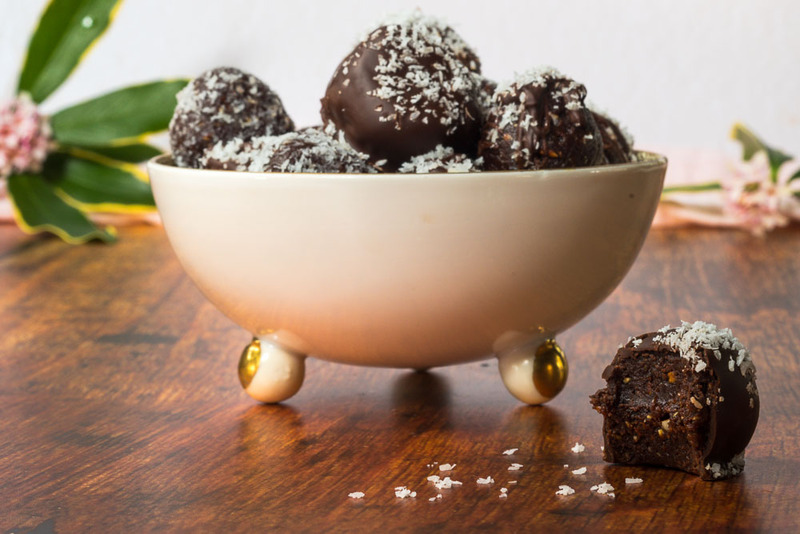 Transfer the truffle back to the waxed paper and sprinkle with the coconut bits so they stick to the top. 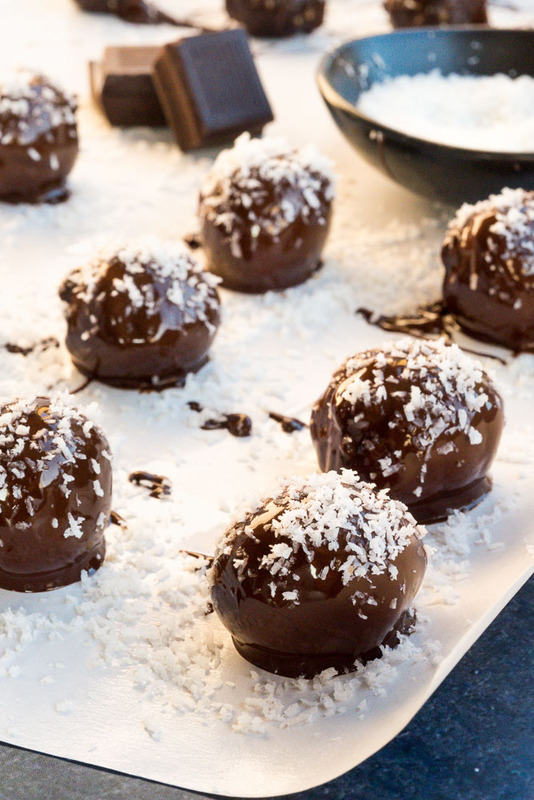 Continue this process until all the balls are fully covered in chocolate and have coconut sprinkled on top. 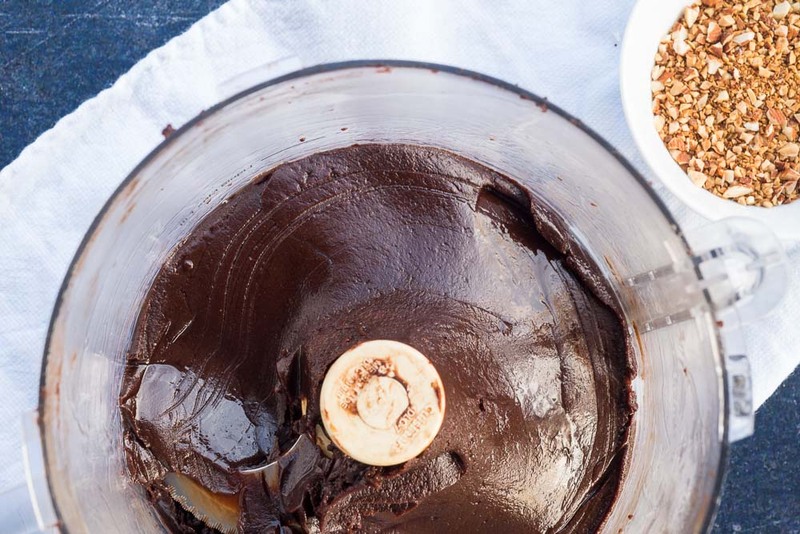 Allow to sit on a table or countertop until the dark chocolate is hard again (a few hours), then transfer to your storage container. Wishing you a happy week. May it be filled with loving YOU! Do you have a friend who could use a reminder to fall in love with themself first and foremost? They can read the goods and then sign up for our Saturday emails. I love this. You are so right in your observations about relationships, and though it sounds simple, it’s really not. It took me well into adulthood to shift my mindset (with the help of a fantastic therapist) to a place that would allow me to get past my trust and self esteem issues, and enter a relationship with a free and open heart. I have a “people-pleaser” and “caretaker” personality, and being with someone who loves *me* – with all my emotions, faults and screwed up family issues – and makes me feel unashamed to take some self care is still, fourteen years later, a revelation. Things are certainly not perfect, and sometimes I dwell on that when my mood is dark. But I feel loved, valued and supported, and that makes me feel I can accomplish anything. As for the batching, I can’t wait to start this week’s collection. This is my third batch (including the sample one), and…wow. Shopping with intention and purpose for US, not for others, feels amazing. Selecting my produce, getting to play with new flavors, thinking about what exactly I’m going to be making with these items, instead of just filling the cart with stuff to put in the pantry or the fridge or freezer “just to have”, gives me the structure I crave. And gently pouring love and skill into food that I know will be appreciated (so far by both me *and* my husband!! ), and that I know will slowly get us healthier, is more comforting than a warm bath with a mug of hot chocolate. Thank you ALL, Team Dirty. I adore you! I love reading Saturday fuckery each week because I always, always take something away from it. This week, I’m been feeling nudged by my good ‘ole Calm app to write myself a valentine…and this solidifies it. I realize for many people, showing themselves some self-love is no problem. But as my therapists will tell you….it is not my forte AT ALL. Blame, shame and all those terrible things lurk around each corner. But as I have reminded myself repeatedly, batching each week feeds my body and soul … and the weeks I claim to not have time to batch? It all goes to hell…fast. So I showed myself some love by batching this weekend in preparation for my week of self-love. On that note…what kind of chocolate bar did you use on these delicious babies? 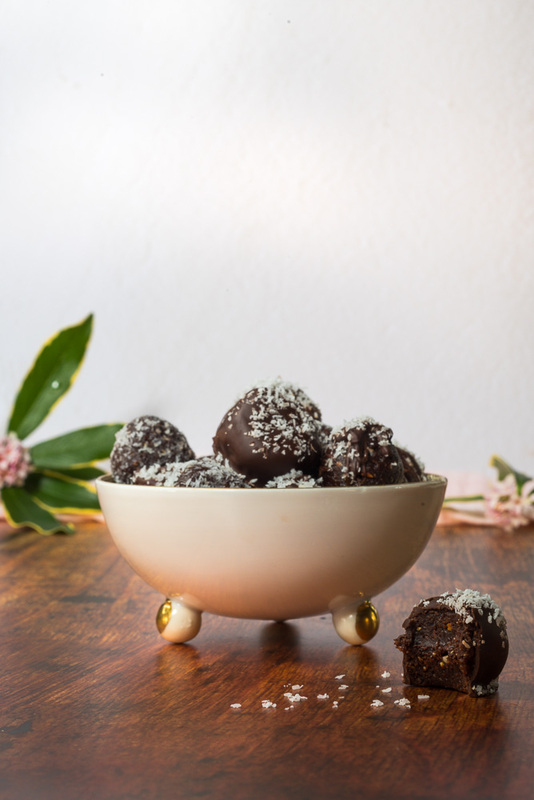 I made the truffles on Sunday and they are AMAZING! 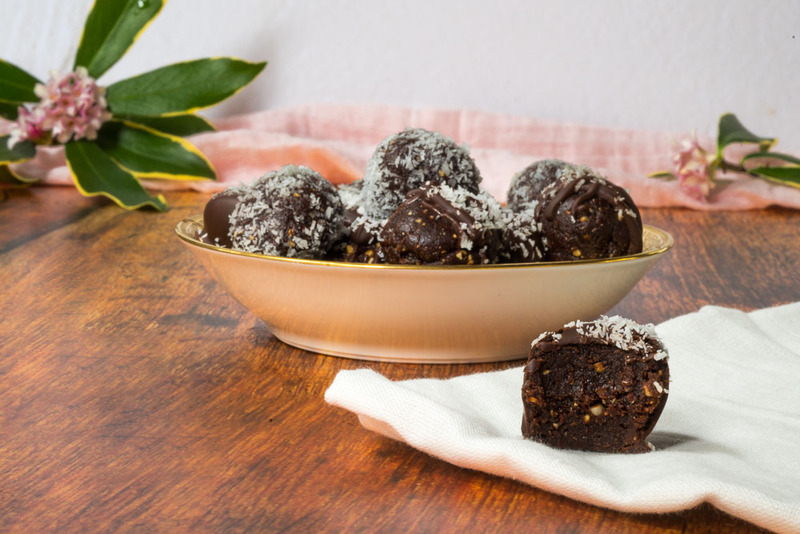 So rich with just a little crunch from the nuts and a little chew from the coconut.